The book is about Horrid Henry and his perfect brother ‘Perfect Peter’. Horrid Henry hates Perfect Peter. There are four stories in this book. The main characters are Horrid Henry, Perfect Peter, mum, dad, Moody Margaret and Miss Battle-Axe. I liked Horrid Henry because he is witty and hilarious. My favourite part was when Horrid Henry tricked Miss Battle-Axe by showing her Peter’s story. I would recommend this book to boys and girls over four years old. I would recommend it because it is interesting and amusing. The message is ‘mischief can be funny but sometimes it is too much’. 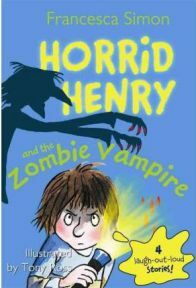 No Comments on "Horrid Henry and the Zombie Vampire"
I was born in 2004. My dad asked me to write about my favourite books for his website. My favourite author is Roald Dahl. I also like tennis, skiing and pancakes.